The British Museum’s ancient Egyptian and Sudanese collection is one of the most comprehensive and magnificent in the world. Masterpieces of Ancient Egypt is the first illustrated guide to the highlights of this wonderful collection. It features over 200 of the most stunning and important Egyptian and Sudanese artefacts in the Museum, including not only internationally famous items such as the Rosetta Stone, but also a wealth of lesser-known but equally significant or beautiful pieces from Egypt and Sudan. The entries are illustrated with stunning full-page color photographs. The objects are arranged in chronological order, beginning with the earliest Prdynastic pots and figurines, and continuing through the three-thousand-year rule of the pharaohs, right up to Roman Egypt and the Coptic Christian period. 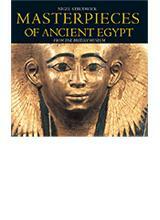 The book thus provides an overview of the whole of ancient Egyptian art and civilization. NIGEL STRUDWICK is an assistant keeper of Egyptian antiquities in the British Museum. He and his wife Helen have worked in the Theban Necropolis since 1984 and have written a number of books, including Thebes in Egypt. His most recent book is Texts from the Pyramid Age.